Cavalier King Charles spaniels have become increasingly popular in recent years owing to their ‘exaggerated head’ with large forward-facing eyes. New research suggests that dog health could be improved if breed show judges were to use their ability to identify differences in the shape of a dog’s head. In the study, breed show judges used a checklist devised by researchers to identify different head shapes in King Charles spaniels. The spaniels had previously been identified as risk factors for Chiari malformation and syringomyelia. 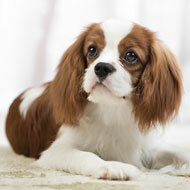 Cavalier King Charles spaniels have become increasingly popular in recent years owing to their ‘exaggerated head’ with large forward-facing eyes. This recent change in head shape is markedly different to the traditional breed standard and research shows that it increases the risk of developing Chiari malformation and syringomyelia. The dog show judges were asked to decide if the head shape of 13 Cavalier King Charles spaniels was “moderate” (traditional) or “exaggerated” (modern). This assessment was then compared to measurements of the dogs’ heads and MRI scan results identifying the presence of syringomyelia. The findings show that judges varied in their ability (20 per cent to 80 per cent) to match the head shape with syringomyelia status, suggesting that visual assessment was possible. The study, Pilot study of head conformation changes over time in the Cavalier King Charles spaniel breed, is published in Vet Record.